Forum Index > Historical Arms Talk > XVI Century postal worker - Carried a weapon? Posted: Sat 27 May, 2017 7:42 pm Post subject: XVI Century postal worker - Carried a weapon? I've recently gotten involved with the local renfaire royal court, and have been trying to find an unfilled niche for a character I can depict. Our dates are c.1525 for the fall faire and c.1575 for the spring faire, with a German cultural background. My current research led me some info about the Kaiserliche Reichspost which fits well into our time period, and I thought this might be an interesting opportunity for a character. 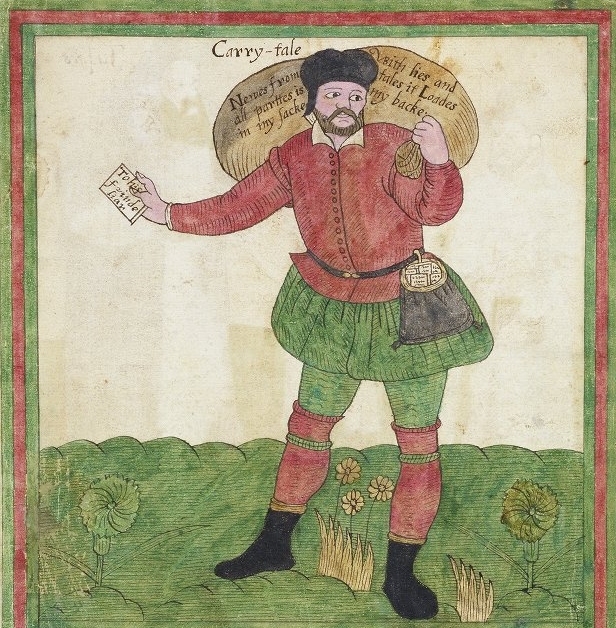 EDIT: Attached pic is from Trevelyon Miscellany of 1608 depicting an English courier - so not quite the same time/place I'm aiming for but gives an idea. "Do something meaningful in this meaningless world." I believe that would have largely depended on whether the post service was supposed to handle valuable items, whether in the form of bullion or jewels or debt certificates. Given the imperial nature of the postal service you have in mind, its use was probably restricted to relatively affluent and/or politically important people who had either the money or the influence to justify their use of the post, so I'd hazard a guess that the postal couriers were not only armed but travelled in groups (or with hired guards in the manner of Wells Fargo agents in the Wild West). A decent compromise might be a good stout walking stick/quarterstaff. You can use it for walking, carrying your mail sack, poking at things, checking river depths etc etc. Best of all it's a stout cudgel to beat knaves on the roadway. Couple it with a utility knife for cutting the purses from those whose skulls you've cracked and you'd probably feel quite comfortable on the road.